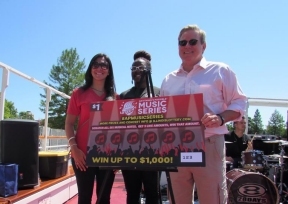 The Illinois Lottery rocked out on the Chicago River in celebration of its newest melodically inspired instant game, Anything’s Possible Music Series. Lottery fans were greeted with tunes from a local cover band, 28 Days, as they boarded Shoreline Sightseeing’s “The Star of Chicago” for an hour-long tour complete with great food, music, and breathtaking views. Each guest onboard was gifted with VIP tickets to the July 10 Janelle Monáe concert at the Taste of Chicago.